Best Buy Co. is going after Grandma. The electronics retailer agreed to pay US$800 million to acquire GreatCall Inc., a provider of smartphones and emergency-response systems for seniors, broadening its push into the burgeoning market for connected-home products and services. 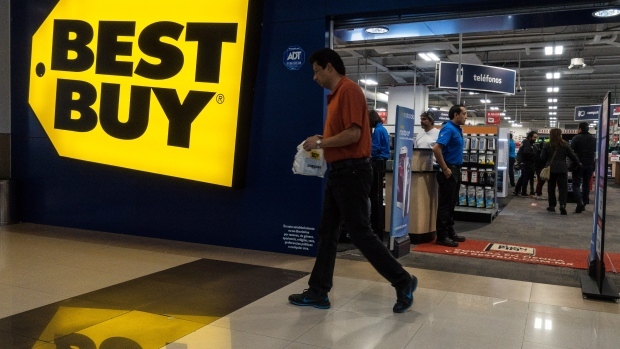 The deal, which should close by the end of the third quarter, will boost adjusted earnings by 2020, Best Buy said in a statement Wednesday. San Diego-based GreatCall, founded by inventor Arlene Harris in 2006 and owned by private-equity firm GTCR for the past year, has more than 900,000 subscribers who use its Jitterbug mobile phones and wearable devices to stay connected to family and friends. Best Buy’s purchase -- its first under Chief Executive Officer Hubert Joly -- will position the retailer to capture more of the fast-growing senior-services market, which Joly has called “white space waiting to be captured.” The GreatCall devices will be part of Best Buy’s new Assured Living unit, which sells networked products like smart doorbells and bed sensors in 21 markets to remotely monitor the health and safety of aging Americans. “We know technology can improve the quality of life of the aging population and those who care for them,” Joly said in the statement. Companies such as Google, Microsoft Corp. and Samsung Electronics Co. are also competing for the market, fueled by compelling demographics. By 2020 about 45 million Americans will be caring for 117 million seniors, spending on everything from food delivery to safety and health monitors. Research by the AARP and consultants Parks Associates found that caregivers will spend an average of $509 annually for each person they tend to by 2021, a 69 percent increase from 2016. GreatCall offers two mobile phones under the Jitterbug brand, along with wearable devices under the Lively label, which GreatCall acquired in 2016. Best Buy was the first retailer to sell GreatCall’s products, which connect users to caregivers, concierge services or emergency personnel. The gadgets are also sold at Walmart, Sears and on Amazon.com, and Best Buy said it would like to continue selling through those other channels. Great Call’s CEO, David Inns, will remain in his position after the sale closes.